Situated in northern France on the banks of the Seine river, Paris is the French capital and a historic city that many claim to be the most beautiful and romantic of all cities in the world. Dubbed the “City of Light”, Paris was visited by over 50 million visitors in 2016, making it one of the most visited cities in the world. This number has only been increasing with Paris filled to the brim with historic landmarks and cultural experiences that can’t be found anywhere else. The far-reaching influences of Paris and its culture are well known; especially in the world of art, fashion, architecture, food and design. It comes as no surprise that Paris is referred to as the Art Capital of the world. With numerous world-class museums that proudly store some of the most iconic works of art ever produced, Paris is also where these artists lived and practised their art. 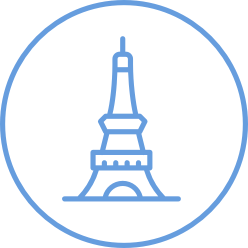 Over the years, artists that have called Paris home include the likes of Renoir, Monet and Picasso to Salvador Dali and Van Gogh. Today, in addition to the big museums such as Louvre, Centre Pompidou and Orsay; there are well over a hundred establishments dedicated to preserving and exhibiting collections from all possible genres. A brief 20-minute walk through any part of the city is sure to provide you with glimpses of stunning Parisian works of architecture in any direction you look. From the Eiffel Tower standing tall in the heart of the city, the ornate Louvre Museum stretching across the Seine waterfront, and the emphatic Arc de Triomphe spanning the entrance to one of the most beautiful avenues in Paris - Champs-Élysées - Paris is a treasure trove of exemplary European architecture. The French are known for their food. It is no wonder they came up with the Michelin Guide, which rates restaurants across the world on standards that can only be met by the best of the best. When in Paris, you must eat like the Parisians. While their baguettes, croissants, cheese, and macarons are world-famous, you cannot miss the duck confit, croque-monsieur, and foie gras. And if you’ve got a sweet tooth, look no further! With a wide range of desserts from the classic Paris Brest to the enticing profiteroles, and from the dreamy mille-feuille to the delectable croquembouche, you are in for a treat! With origins that go back to the 16th century, Paris and cabaret go hand-in-hand. Combining dance, music, song and drama into a sensuous work of performance art, cabarets have been extremely popular in the French capital since their early days and remain as popular with visitors to the city and locals alike. No visit to Paris is complete with enjoying a cabaret at one of its iconic establishments - be it the 19th century Moulin Rouge and Paradis Latin or the relatively newer Crazy Horse and Lido. Palace of Versailles Discover the Palace of Versailles, situated just outside Paris. llustrating more than five centuries of French history, the Palace not only houses remarkable works of art - it stands as a work of art itself. Paris Hop On Hop Off Bus Tours Travel through Paris like a pro with these hop-on-hop-off bus tours. Visit all the famous landmarks of Paris, enjoy the sights from top of an open-air bus and board & get off whenver you want. Museums in Paris From the renowned Louvre and its exhibits of world art to the Impressionist treasures at Orsay and Pompidou's modern collections, Paris is home to some of the most prominent museums in the world. Avoiding the Queue at Major Paris Attractions Don’t let the queues scare you into believing that visiting Paris’ famous attractions is a logistical nightmare. Check this guide out to discover a few simple tricks that you can use to get past these lines. Short on time and unable to plan your Paris holiday? Take a look at these meticulously crafted itineraries that have been designed to help you make the most of your stay in Paris - taking in all that makes Paris one of the most beautiful cities in the world.